Extract blood from people just for fun. Config menu to MUTE the music. You can create a MOSQUITO with the top left button. Mosquitos extract BLOOD. 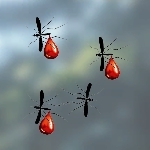 Each mosquito has a BLOOD CAPACITY, it is the amount of blood it can store. This is the amount of blood that it added to the TEST TUBE when the BLOOD DROP is dropped inside of it. 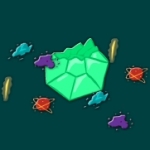 When the test tube is full and you keep adding blood you add LEVEL POINTS, this increases your level and the MAX BLOOD STORAGE in the test tube. * Mosquito movement speed, blood extraction speed, and max. blood capacity. * Level points per blood unit. Example: if a mosquito has a capacity of 10 and the extraction speed is 5 it will take 2 seconds to fill its storage. If a mosquito has a capacity of 10 and the extraction speed is 20 it will take half a second. - ACHIEVEMENT points: click the yellow star to see your achievements. Each level increases the achievement multiplier. - ASCENSION: when you reach level 200 you start adding 0.005 to the multiplier for each level beyond 200. It will be aplied when you ascend. - So the real value of a blood of drop is: blood capacity * ascension multiplier * achievements multiplier. There is a BATTLE panel. You fight other mosquitos. Every time you kill one of them, the next one has higher HP and DAMAGE. You can upgrade your mosquito hp and damage. When you ascend, not everything is reseted. BATTLE and ACHIEVEMENTS are not reseted. Clicker, IdlerAlso known as "Jew Simulator", this game appears to be Polish and follows the standard clicker style gameplay. Clicker, IdlerFun idle game where you get to work on different spells. Each spell earns you cash in different ways, and you have different upgrades, gems to improve any spell, talents to improve different global stats and essence acting as "reset" with perks. Clever and interesting sequel of Spell Idle. Clicker, IdlerA simple clicker that implements exponential growth. IdlerBuild your fortress step by step. 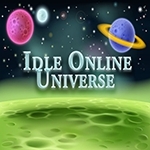 Clicker, IdlerBuild the world’s largest idle game mosaic... with goats.